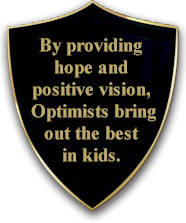 Our positive approach, our upbeat outlook, and our commitment to creating a more optimistic future for kids is what differentiates Optimist Clubs from any other volunteer opportunity. Communities in the United States, Canada, the nations of the Caribbean and other countries throughout the world have been touched by the powerful, positive force of Optimist Club Members. From sponsoring youth athletic leagues to weatherizing the homes of the elderly to conducting oratorical contests for young people-Optimist Clubs are responding to the special needs of our local communities. Although we come from all walks of life, Optimist Club Members share one common trait. We know that we can make a difference in the lives or others.